I had my first solid day in the garden this week, but before I get to that, I think I should mention (as I haven’t already) the afternoon of “prep” put in with my friend Krys when she was visiting. The first bit of prep required every spring is some removal. I introduced Krys to one of the joys of gardening when your garden is surrounded on three sides by pine trees: removing all the pine cones that have accumulated over the winter. I left her to it while I got on with trimming the berry plants and clearing the pine needles and cones from the raised beds. Like my first time performing this job, she couldn’t believe how many frigging pine cones there were – and how well some of them were hidden. I told her I’d actually counted one year and the total was 837. Although peas and beans did grow well last year, everything else was a bit of a disappointment. This led me to conclude that my four-year-old sea soil may have been depleted of its nourishment and was in need of supplement. After making some enquiries about fertiliser used by other, quite successful gardeners, we made a trip to the garden shop where bags of steer manure and bone meal were purchased. Job number one this week was the raised bed: digging the soil over, soaking the bone-dry-at-the-bottom soil, digging in the steer manure, planting some peas and, yes, covering the rest of the bed to ensure Stella doesn’t use it as a giant litter box before I get around to planting other things. What to plant? What to plant? In previous years (but not recently) I’ve had some luck with beets. I’ve never had much luck with carrots. Should I give up or should I never say never? Despite being told that lettuce is easy to grow, I’ve never had much luck in the raised bed, but last year I had considerable success growing both lettuce and rocket in containers. 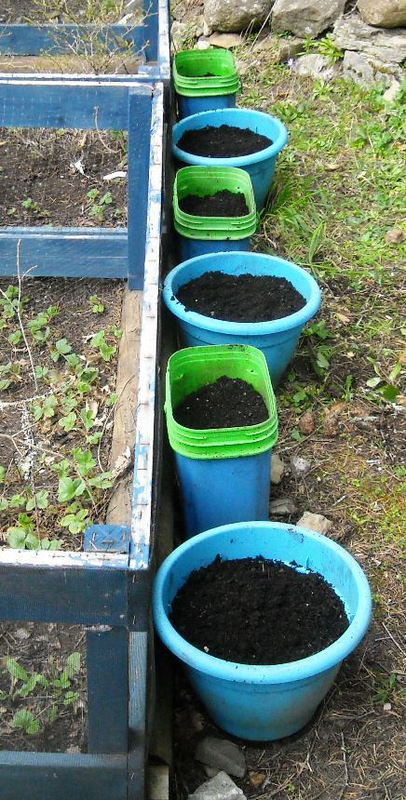 Okay, for now, let us plant some lettuce seeds. Beyond lettuce and peas, I just can’t decide about veg, but one decision is easy peasy: I need to make sure I’m helping out the bees (and other pollinators). Into the smaller pots I have planted, from bottom to top (so I’ll remember): hummingbird-friendly, butterfly-friendly and bee-friendly wildflower seeds. I may not be successful at feeding myself from my gardening efforts, but, by god, I am determined to feed the bees.